Delusional (Major): (Iconic Framework) He is Heracles, reborn! The Deadboys and Skelebots are obviously the minions of his Uncle Hades, Lord of the Underworld. Monsters and evil spellcasters he faces are obviously working for his stepmother Hera. Etc. Heroic (Major): This noble soul never says no to a person in need. He doesn’t have to be happy about it, but he always comes to the rescue of those he feels can’t help themselves. He’s the first one to run into a burning building, usually agrees to hunt monsters for little or no pay, and is generally a pushover for a sob story. Loyal (Minor): Your character would give his life for his friends. This character can never leave a man behind if there’s any chance at all he could help. Outsider (Minor): (Racial) See Racial. Overconfident: There’s nothing out there your hero can’t defeat. At least that’s what he thinks. He believes he can do most anything and never wants to retreat from a challenge. He’s not suicidal, but he certainly takes on more than common sense dictates. Whenever a character is in the presence of his phobia, he subtracts 4 from all his Trait tests as a Major Hindrance. Due to the some of his Twelve Labors (among other things, like almost being killed as a child by one), Heracles has an irrational (some would say healthy) fear of snakes of all shapes and sizes. Elan: When this spirited hero puts his heart into something it tends to pay off in big ways. When you spend a Benny on a Trait roll (including Soak rolls), add +2 to the final total. action if he is on Hold or has not yet acted this round. attack against each and every foe who moves adjacent to him. Jack-of-all-Trades: Any time he makes an unskilled roll for a Smarts-based skill, he may do so at d4 instead of the usual d4–2. Spend 2 ISP when rolling their Psionics skill to gain a +1 to the roll, or 4 ISP for +2. Spend 1 ISP to double the Range of a power, or 2 ISP to multiply the base range × 10.
before the roll. While on a ley line, all above bonuses are doubled in effect. Off The Handle: A Crazy with this Edge can start Losing It as a free action. Interestingly, such a Crazy also has an easier time coming out of it. He doesn’t suffer the usual −2 penalty to his Smarts roll when trying to recover. Quick (IF): Whenever you are dealt a 5 or lower in combat, you may discard and draw again until you get a card higher than 5. Characters with both the Level Headed and Quick Edges draw their additional card and take the best as usual. If that card is a Five or less, the Quick Edge may be used to draw a replacement until it’s Six or higher. Split The Seconds: This Edge grants an extra action to the character each round. There is no multi-action penalty for this action, and it can be a repeat action, such as firing a gun or swinging a sword again. It cannot, however, be used for movement, such as Running. Sublime Chaos: While Losing It, a Crazy with this Edge is able to perform actions not normally allowed by Berserk, including using her psionics. She also only suffers a -1 to Trait rolls during her Coming Back period. Breed Advantage (Strong and Tough): A Dog Boy begins with the Breed Advantage Edge (see sidebar). The player decides what breed (or breeds) the character is influenced by. After creation, the Dog Boy may take the Edge again at Novice Rank. Keen Sense of Smell: Dog Boys have a sense of smell similar to their canine counterparts. They gain a +2 bonus on Notice checks based on smell, as well as +2 on all Tracking rolls. Natural Weapons: Dog Boys bite for Str+d6 damage. Outsider: Dog Boys are awkward around human populations, and people outside the CS may be frightened of them because they are so closely identified with that regime. They have the Outsider Hindrance and a -2 Charisma with everyone except other Dog Boys. 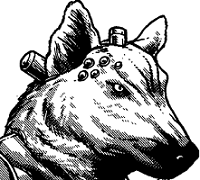 Psychic Sense: Dog Boys have the inherent ability to detect arcana, interpreting it as a scent. They use the Notice skill (with their Keen Sense of Smell bonus) to detect the presence and location of psychic or magic energies, beings, or items. They can also use the Tracking skill (also with the Keen Sense of Smell bonus) to follow a specific magical or psionic entity. This sense works to detect anything psychic, magic, or supernatural, including invisible and astral beings. Psychic Sense doesn’t work inside sealed armor or vehicles. Cybernetic implants also cause problems; every point of Strain imposes a -1 penalty when the Dog Boy uses his Psychic Sense (the Cyber-Psychic Alignment Edge can negate this penalty). Restricted Paths: Inherent psionic limitations make arcane magic impossible. Dog Boys cannot take any Arcane Background using PPE, nor any Iconic Framework that includes it. Wanted Hindrance (Minor): Dog Boys operating outside of CS control are wanted by the Coalition, and there’s always a fair bounty for bringing one in. Weakness (Ley Line Hypersensitivity): Dog Boys lose their Psychic Sense on or close (within 2" or 4 yards) to a ley line. Ley Line storms cause a level of Fatigue from severe headaches and distress as for a psychic (which does not stack if they have the Arcane Background), but their Fatigue requires an hour to recover after the storm ends. −4 Target within 10” (20 yards) of a ley line or source of supernatural energy. −2 Target within 25” (50 yards) of ley line or source of supernatural energy. −2 Target within a large group of living beings (a bustling city street or herd of animals). −2 Target or sensing character near a powerful supernatural entity (a dragon or greater demon). −2 Tracking target 24–48 hours since in area. −4 More than two days since target was in area (targets cannot be tracked after a week). Losing It: The Crazy always enjoys a certain level of preternatural capabilities, but he also has moments where he can completely unleash his potential by Losing It. Throwing caution to the wind and shoving rational thought to the back of his mind, a Crazy gains the effects of being Berserk (as per the Edge). This can be done at will, as an action. While he is Losing It, the Crazy is Fearless (see Monstrous Abilities in Savage Worlds), making him immune to Fear and Intimidation. While in this state, he cannot use her psionic abilities, nor anything requiring concentration. While Berserk, his Parry is reduced by 2 but he adds +2 to all Fighting, Strength, melee damage rolls, and Toughness. The warrior ignores all wound modifiers while Berserk, but cannot use any skills, Edges, or maneuvers that require concentration, including Shooting and Taunt, but not Intimidation. Berserkers attack with reckless abandon. Anytime his Fighting die is a 1 (regardless of his Wild Die), he hits a random adjacent target (not the original target). The attack may hit friend as well as foe. If there are no other adjacent targets, the blow simply misses. The Berserker may end his rage by doing nothing (not even moving) for one full action and making a Smarts roll at –2. Raise: He only spends 1d6 minutes Getting It Together. Success: He spends 1d6×10 minutes in the Getting It Together state. Failure: He spends 1d6 hours Getting It Together. Critical Failure: He spends the next 24 hours Getting It Together. Bio-Regeneration: Awakening certain portions of the brain via the Mind Over Matter implants grants the Crazy a natural healing roll once every 24 hours. Enhanced Attributes: Crazies gain +2 die types to Agility, Strength, and Vigor. These traits have no maximum. Enhanced Speed: Crazies double their base Pace. Heightened Senses: Crazies gain +2 to Notice and Tracking rolls. They also ignore two points of Range penalties. Minor Psionic: Unlocking the brain’s potential grants a Crazy Arcane Background (Psionics), 10 ISP, 3 powers, and Psionics d6. Quick: Crazies begin with the Quick Edge. Super Endurance: Crazies require only half the normal amount of sleep, and gain +4 on all checks to resist Fatigue. Super Reflexes: Crazies have uncanny reflexes, granting them a -2 to be hit as long as they are aware of the attack. Cybernetics: Crazies suffer -1 to Psionics per point of Strain (page 108). Distinctive Appearance: The protrusions from the skull alone mark a Crazy for what she is. Most also indulge in tattoos, body piercings, and other means of declaring themselves to the world. Magic: M.O.M. implants jumble the mind in such a way as to make the use of magic impossible. Needs Action: Crazies live in a constant state of heightened adrenaline and awareness, even those suffering from depression cannot escape the feeling. During particular slow periods, the Game Master may call for a Spirit roll. Failure means the Crazy gains -2 Charisma as she becomes irritable and impatient. She also suffers a -1 to all Trait rolls from the distraction of her frenzied mind, until some kind of high alert status or action kicks in. Unstable Psyche: From the start (and for no added benefit), the character gains a psychological or emotional Hindrance determined by rolling on the Psyche Degradation Table. Representing the constant degradation of the Crazy’s psychological state, the character gains an additional Hindrance from the table each time she achieves a new Rank. Last edited by Heracles on Sun Jan 06, 2019 10:49 am, edited 26 times in total. Chain Long Sword (Dmg Str+2d8. Wt 15. Cost 14,000) Notes: AP 2, Mega Damage. water from occupants, thus extending water supplies by 20%. *One sleeping bag, also insulated. *One flashlight, with a concealed pocket knife. Miniaturized solar panels give it near-infinite operation under typical conditions. *One hunter/fisher kit, containing wires, line, hooks, and other elements necessary for fishing and small game trapping. This provides +1 to Survival checks where food gathering is concerned. *Three saw wires, composed of serrated, high tensile strength wire and two ring handles. Capable of slicing through wood, stone, and even non-Mega metals. *One fire starter, a combination solar powered ignition cell and flint sparker (with six extra flints). *One survival knife, one small hatchet, and one wooden cross. *One climbing kit with 30 feet of lightweight cord, a pair of climbing gloves, four ceramic spikes, and a small mallet. *One bar of soap and a sterilized cloth. *Two weeks worth of minimal sustenance survival rations in sealed pouches. Notes: Mega Damage, AP 2. Major: Add a Heroic Edge (Improved First Strike) to device and +1 Power Point to activate cost [+60,000 +7d6 days]. Major: Add a Veteran Edge (Improved Frenzy) to device and +1 Power Point to activate cost [+80,000 +9d6 days]. Major: +10 stored PPE only usable to charge the device. (Recovers at a rate of 1 per 15 minutes at a Ley Line). [30,000, +4d6 days]. Wilk’s 237 Laser Pistol (Rng 15/30/60. Dmg 2d6+1. ROF 1. AP 4. Shots 16. Wt 3. Cost 24,000) Notes: Semi-Auto, 2 spare clips. Wilk’s 447 Laser Rifle (Rng 40/80/160. Dmg 3d6. ROF 1. AP 2. Shots 20. Wt 5. Cost 18,000) Notes: Semi-Auto, 2 spare clips. Last edited by Heracles on Sun Jan 06, 2019 10:54 am, edited 7 times in total. Hello. I'm leaving this journal in case something goes wrong. I was born to a pair of escaped Coalition Psi-Hounds. My parents named me Lucky, as I was the only survivor of my litter. My mother Mena was sick, and some of that passed on to the litter apparently. She called me her little lucky miracle. Of course, I was thin and sickly, a real runt. My folks worried about me, and watched me carefully for a long time. They kept me indoors most of the time, and brought me toys and later books. Books! Oh, how I love books! I read voraciously, using it as my means of living vicariously since I wasn't allowed to go outside really. Tales of heroics and monsters were my favorite! But I have read books on most subjects, even studied several languages. My father Brutus was killed by the Coalition when I was still fairly young. I didn't learn that til much later though. My mother merely told me he'd gone on to a better place. She raised me herself as best she could. She did manage to have a few more pups by my father before he died and most of them were like me, sick and small. We looked out for each other while mother worked very hard to make a living for us - several livings actually, as she worked more than one job. About a year ago, the family disease finally overtook her and she dropped in to a coma. Things are bad. The doctor here tells me he can perform a surgery on me that will not only stop the same thing from happening to me, but also make me better than I could ever be, enough so I could go out and make money to support my family and fund the doctor's research in to curing my mother and siblings. How can I say no to that? A chance for a normal life for everyone in my family for the low-cost of experimental surgery? Even if it doesn't work, if I...die...the doctor said he will work on the cure anyway. I go under the knife in 2 hours. Here's hoping I wake up a whole new dog! Very well. I will speak for this...posterity you talked of. History and oral stories are a large part of my culture. I...am Heracles, born anew! I am the son of Zeus! My mother is Alcmene, though she goes by Mena for short. She is gravely ill, and I worry for her continued life. Father has not or will not answer my prayers. So I must do what I can myself. This..."Doctor" here, a priest of some sort I gather, has told me that he will try to find a cure for my mother and her children if I will send money to him. I find this arrangement to be acceptable. I will go out in to the world and perform heroics. Apparently people of this era will pay for that with more than just food, drink and lodging for the night. I have learned much of this era in a short time. I have learned of guns and armor, things called vehicles - even ones that can soar in the sky like my stepbrother's chariot which sees the sun put in to the sky each day! And magic still exists, which is a small comfort, though many use it for evil purposes as before. I have joined a strange group that calls itself the Tomorrow Legion. I have twice met a woman named Danielle Anera. Dani and I first met and helped each other facing against a foul spellcaster that summoned fearsome beasts to his beck and call! This Shifter called himself Gragnir The Greater, and is apparently a member of an entire evil country of spellcasters and demons called the True Federation of Magic! The second time Danielle and I crossed paths, she was with a small group of others, on their way to help a village from what she called the Coalition. I offered my aid to their cause, and as we traveled she and the others told me of the organization they are part of, the Tomorrow Legion. The Tomorrow Legion has many members of many races and persuasions, but their hearts are in the right place. They hunger to help others! They do good deeds and protect those unable to protect themselves! I find this very worthy. My uncle, Hades, is still out trying to conquer the lands of the living. He sends out his skeletal undead in their black armor and skulls. I have fought his minions several times now, though Hades himself has refused to face me. My step-mother Hera also still wishes me dead. She sends monsters and evil spellcasters out after me. I fear the Federation of Magic heeds her commands and desire to see me dead. I pray one day my mortal family will be cured of their disease. Also, I hope one day to make my father proud enough of my heroics to accept me in to Olympus. I have returned once again to check on my family. My mother looks...better, but is still in the deathless slumber the doctor calls a 'coma'. Her body does not look as weak as it did once, so for that I am grateful. The doctor wished me to speak more for his posterity project...and in case anything happens to me, my family can have something from me aside from the money I have saved for them. I have seen much in this new world, I have traveled far across this continent and battled many enemies. Though this land can be harsh at times, I have also seen many beautiful and wondrous things. However, I have traveled with Dani several times and yet does she doubt the veracity of my claim to be Heracles reborn. She has witnessed me perform many feats beyond the ken of normal mortals and yet it does not sway her! She says I am merely crazy, as if that would explain away all I can do! I will give you some examples. We came across a dying warrior who had been laid low by the minions of Hades. He told me his name was Aralin, and asked who I was. I gave him my name. Having heard of me, he said he knew I was an honorable man, and asked if he might impose two favors upon me. He asked me if I would see him properly buried so his soul could rest, and if I would take up his sword to continue the fight against the evil of the Coalition. I could not deny him these requests, of course, and though his weapon was strange to me at first I later learned to use it with great skill. I buried him and performed the proper rites. I also sent word to his family in a settlement quite some distance away so they would know of his fate. Who else but Heracles would the man have simply heard of and trusted to be honorable? Dani claimed that the warrior was already dead by the time we reached him and it was strange how I sat down to talk to the corpse for several minutes before burying him and taking his chain long sword for my own. And she calls ME crazy! Dani claimed that the Heracles of legend did not posses the abilities that I do, what she calls Psionics: The ability to heal myself; the way I can become stronger or more agile or more resistant to harm; how hard it can be for enemies to strike me; and how hard I can strike back. I laughed, of course. Heracles could do all these things and more! How would she know? She was not alive during my first incarnation, and not all myths and legends are absolute truth, after all. For instance, the healing is a gift from my stepbrother Apollo. He came to me in a dream and gifted me with the knowledge of how to use it. That is why when I heal myself a light glow envelops my eyes and the wounded area. It is the light of Apollo, care-taker of the sun itself! He has seen me do battle many times, seen me injured as well, and knows that for a warrior such as I to fall would be a great detriment to the world. Dani and I were approached by a bloodied and weary man one night whilst we drank in a tavern. The man said his name was Christof Neumann, and he spun us a quick tale of a distant homeland that they had been ripped from by a rift that had opened when they were set upon and chased by winged creatures called Gargoyles - 'they' being a small group of people in a pair of vehicles making a delivery of weapons, armor and goods. Christof said that the trip through the rift had left them disoriented, but the fearsome gargoyles recovered quickly. The rest of his comrades were either killed or captured. Of course Dani and I agreed to help him, and headed out less than an hour later. Using my tracking to find where the gargoyles had found a lair, Dani scouted the area. We waited until the monsters slept before silently moving in to attack quickly before they were roused. The leader of the gargoyles was massive and I leapt upon him, slashing at him and using my own body to keep him from unfurling his wings! It was a hard battle, and I have this scar to show for it! Dani had a limp for a few months afterwards. Christof was so grateful for our aid that he allowed us to take some of the cargo for our own in repayment. I found this well-forged armor that I now wear, and it has served me very well since. Dani believed that any brave warrior could have fought as I did, killing the gargoyle's leader. Her doubt is a sting in my side! We spent some time exploring some ruins of an old forgotten kingdom. We knew it would be potentially deep underground but might have some valuable knowledge or artifacts, so I purchased a good set of climbing gear along with some other goods for us before we left the nearest city. It was quite a trek there but we made it. We had to scale down in to a long tunnel that served as the only known entry. It was a steep, deep climb of many hours, treacherous and slick on the surfaces. The place held several of what Dani said used to be elevators, but all I know is that we had to climb down and up in several smaller shafts in the complex as well. At one point I was the only one still maintaining my grip and holding the other two with my strength for several minutes until they could stop spinning in the air and get their own holds again. Dani claimed that anyone wearing my enhanced armor could perform the same feats of strength and climbing as I. Last edited by Heracles on Sat Dec 30, 2017 12:14 pm, edited 2 times in total. Description: You may choose any one of the previous results. Chose 1 extra novice power. +2 to the skill if he already has it. He also has a good set of climbing gear for a party of four. apply all other results from rolling on this table to your newly chosen body armor. Streetwise checks in North America. Last edited by Heracles on Sun Jan 06, 2019 10:48 am, edited 5 times in total. Seasoned Psyche Degradation Table: 1d6 = 6: 6 - Phobia (Major). Veteran Psyche Degradation Table: 1d6 = 5: 5 - Overconfident.